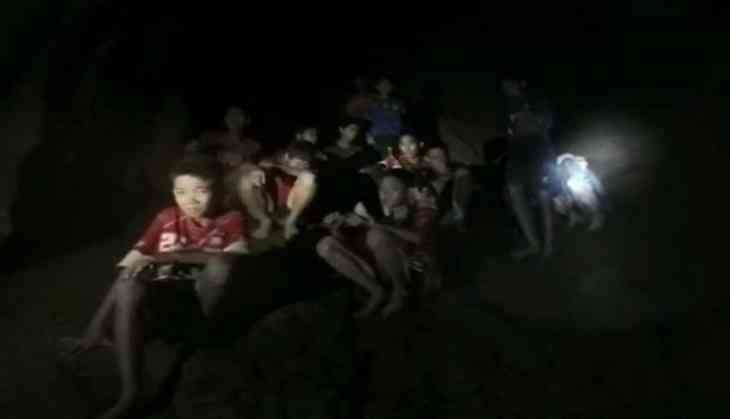 Rescue teams have found the 12 boys and their football coach, who had been trapped in a flooded cave here for nine days. Aged between 11 and 16 years old, the boys were members of the Wild Boar soccer team, CNN reported. On June 23, the boys and their 25-year-old coach had entered the Tham Luang network of caves on a team outing. However, they were stranded following a heavy and continuous downpour that flooded the cave. The team was focused on reaching a deep chamber in the cave system, dubbed as 'Pattaya Beach', where they believed the group had sheltered themselves. The governor of the Chiang Rai province, Narongsak Osottanakorn, spoke to reporterson Monday night, confirming the safety of the boys and their coach. He stated that the rescue team found the Pattaya Beach to be flooded. 300 to 400 meters ahead, they located the group. The Thai Navy seals released a video footage on their official Facebook page showing the moment when the group was found. However, Governor Osottanakorn stated that the mission was not over yet and that extraction of the boys would be a difficult process. He also mentioned that a medical team was needed to assess their health. "We will drain all water out from the cave then we will take all 13 people out of the cave. We are now planning how to send (a) nurse and doctor inside the cave to check their health and movement. We will work all night," Osottanakorn said. A rescue consultant said that the boys and their coach would most likely be required to dive to exit the cave system.